The abuse of and addiction to opioids is a serious and challenging public health problem. Deaths from drug overdose have risen steadily over the past two decades and have become the leading cause of injury death in the United States.1 Prescription drugs, especially opioid analgesics—a class of prescription drugs such as hydrocodone, oxycodone, morphine, and methadone used to treat both acute and chronic pain — have increasingly been implicated in drug overdose deaths over the last decade.2,3 From 1999 to 2013, the rate for drug poisoning deaths involving opioid analgesics nearly quadrupled.4 Deaths related to heroin have also increased sharply since 2010, with a 39 percent increase between 2012 and 2013.5 Given these alarming trends, it is time for a smart and sustainable response to prevent opioid abuse and overdose and treat people with opioid use disorder. The U.S. Department of Health and Human Services (HHS) has made addressing the opioid abuse problem a high priority and is committed to accelerating its work towards two broad goals: 1) decreasing opioid overdoses and overall overdose mortality and 2) decreasing the prevalence of opioid use disorder. Priority areas for action were identified through a Department wide effort that tapped all the scientific, analytical and programmatic expertise contained in HHS agencies. The development effort also relied on discussions with states and other stakeholder organizations. These priorities—prescribing practices, naloxone, and MAT—will guide the Department’s targeted efforts to take steps that will reduce opioid-related morbidity and mortality. Mortality data show that there was a 6 percent increase in drug overdose deaths between 2012 and 2013 (see Table 1). Approximately 37 percent (16,235) of overdose deaths involved prescription opioids, a number essentially unchanged from 2012. However, the mortality rate from heroin overdose increased each year from 2010 to 2013. Deaths from heroin overdoses increased by 39 percent from 2012 to 2013 alone and were approximately 19 percent (8,257) of all drug overdose deaths in 2013. Although available literature indicates that abuse of prescription opioids is a risk factor for future heroin use, only a small fraction, roughly 4 percent of opioid abusers, transition to heroin use within five years of initiating opioid abuse.21 The assertion that a crackdown on the supply of opioid pain relievers is the driver of the recent increases in heroin use and deaths does not appear to be supported by the currently available data. HHS continues to collect data to monitor the relationship between heroin and prescription opioids. These data underscore the importance of effective interventions to prevent opioid abuse and overdose and treat opioid use disorders. There is a limited but growing body of research that supports the effectiveness of several interventions to address opioid abuse. Continued monitoring and evaluation are essential to further strengthen the evidence base and inform program and policy decision making. There is a clear correlation between opioid prescribing rates and overdose death rates in the United States. From 1999 to 2010, opioid prescribing quadrupled in parallel to increasing opioid overdose death rates.2 These data underscore the importance of prescribing guidelines that encourage the use of opioids when benefits outweigh risks and that promote safe use when opioids are needed. There is limited research available to assess the impact of prescribing guidelines, and additional study is needed to better understand how to optimally operationalize them. However, a recent study of workers compensation patients in Washington State found that after the introduction of voluntary opioid guidelines in 2007, there was a 27 percent decline in the mean dose for long-acting opioids, a 35 percent decline in the percentage of patients receiving 120 morphine milligram equivalents per day or more, and a 50 percent reduction in opioid-related overdose deaths among injured workers.35 If followed and universally implemented, integrating guidelines into electronic health records or clinical decision support platforms may help to reduce inappropriate prescribing of drugs commonly involved in overdose deaths. Naloxone is an effective drug to reverse overdose from both prescription opioids and heroin.36,37,38,39,40 As an opioid antagonist, naloxone binds to opioid receptors and can reverse the effects of other opioids. It can quickly restore normal respiration to a person whose breathing has slowed or stopped as a result of heroin or prescription opioid overdose. Several overdose education and naloxone distribution programs have been developed to issue naloxone and provide instructions on its use to opioid users, their friends and loved ones, and other potential bystanders. An article in Morbidity and Mortality Weekly Report reported that as of 2010, programs that distribute naloxone to nonmedical personnel had reported more than 10,000 41 overdose reversals nationwide since 1996. As of November 2014, 23 states have statutes that allow for “third-party” prescriptions of naloxone (i.e. the prescription can be written to friend, relative or person in a position to assist a person at risk of experiencing an opioid overdose).42 An evaluation of Massachusetts’ overdose education and nasal naloxone distribution program found that opioid overdose death rates declined in communities where programs were implemented.38 Given the effectiveness of naloxone in overdose reversal, the Food and Drug Administration (FDA) has encouraged innovations in more user-friendly naloxone delivery systems such as auto-injectors, made particularly for lay use outside of health care settings. FDA approved such an auto-injector in 2014. HHS is already taking steps to implement the Secretary’s new initiative. President Obama’s FY 2016 Budget includes an increase of $99 million above FY 2015 for targeted efforts to reduce opioid-related morbidity and mortality and the prevalence and impact of opioid use disorders. Building off the infrastructure of the Prevention Boost and Core Violence and Injury Prevention programs, CDC received $20 million in FY 2015 and will launch the Prescription Drug Overdose Prevention for States program, which will target states with high burdens of prescription drug overdose morbidity and mortality. This funding will expand state-level interventions that focus on improving prescribing to prevent overdose, including enhancements to PDMPs. Another $65 million is proposed in the FY 2016 President’s Budget to expand the program to all 50 states and Washington, DC. The PDMP component of this program is designed to advance broad adoption of universal, real-time, actively managed PDMPs. Also in FY 2015, CDC is initiating a rigorous evaluation of this new program that will inform program improvements to ensure the highest public health impact as the program expands. To improve clinical decision making to reduce inappropriate opioid prescribing, CDC is developing guidelines for opioid prescribing for chronic pain outside the setting of end-of-life care. To ensure effective implementation of guidelines, the Office of the National Coordinator for Health Information Technology (ONC) will build upon this work by exploring opportunities to convert guidelines into standardized, sharable, health IT-enabled clinical decision support interventions. The National Institute on Drug Abuse (NIDA) within the National Institutes of Health (NIH) is supporting a number of research trials exploring the efficacy of prescribing take-home naloxone for individuals at high risk of prescription opioid or heroin overdose or at high risk of witnessing an overdose. FDA is also supporting the development of new opioid overdose treatments by using its expedited review programs. States are now permitted to use some of their substance abuse block grant funds to purchase naloxone and the necessary materials to assemble and disseminate overdose kits and increase education/training on the use of naloxone. The FY 2016 President’s Budget proposes that Substance Abuse and Mental Health Services Administration (SAMHSA) issue $12 million in grants to states to purchase naloxone, equip first responders in high-risk communities, and provide education and the necessary materials to assemble overdose kits, as well as cover expenses incurred from dissemination efforts. NIDA is currently supporting research on the effects of the ACA on MAT implementation and the efficacy of implementation strategies for MAT in medical and criminal justice settings, among other study topic areas. In addition, FDA is also promoting the development of medications for the treatment of opioid use disorders by using its expedited review programs. In FY 2015, SAMHSA will provide $12 million through a demonstration grant program to expand treatment services for opioid dependence. Grants will provide accessible, effective, comprehensive, coordinated, and evidence based MAT and recovery support services including the use of FDA-approved agonist medications (e.g., methadone, buprenorphine products including buprenorphine/naloxone combination formulations and buprenorphine mono-product formulations) for the maintenance treatment of opioid use disorder and opioid antagonist medication (e.g., naltrexone products including extended-release and oral formulations) to prevent relapse to opioid use education. The FY 2016 President’s Budget proposed an additional $13 million expansion of this program to increase the number of states that would receive targeted funding to address prescription drug misuse and heroin use through expanded MAT services. HHS is also exploring policy changes that would increase access to providers certified to deliver MAT. 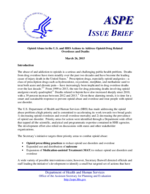 Many activities that fall within the three priority areas of the Secretary’s initiative are currently or soon to be underway and represent significant additional investments in opioid-drug related activities proposed as part of the President’s FY 2016 Budget. The President’s FY 2016 Budget proposes an increase of $99 million above FY 2015 for targeted efforts to reduce opioid-related morbidity and mortality and the prevalence and impact of opioid use disorders, which includes both prescription opioids and heroin. HHS continues to coordinate with agencies across the Department to ensure effective implementation of the initiative’s programs and policies. HHS has also prioritized the development of an evaluation strategy to identify the most effective strategies and inform future policymaking that will have the greatest public health impact. Evaluation is a critical component of the initiative to identify what works and how the most effective interventions can be taken to scale. HHS leadership has joined together to aggressively implement the new initiative and monitor progress. Many activities are already underway, and the Department continues to seek opportunities to work with its partners on this critical issue. The challenges are significant, and thus the Department looks to all stakeholders – at all levels of government, industry and providers – to help address this crisis. Sources: Centers for Disease Control and Prevention. Wide Ranging Online Data for Epidemiologic Research (CDC WONDER). Available at: http://wonder.cdc.gov/. Centers for Disease Control and Prevention. Web-based Injury Statistics Query and Reporting System (WISQARS) [online]. 2014. Retrieved from: http://www.cdc.gov/injury/wisqars/fatal.html. Paulozzi L, Jones C, Mack K, Rudd R; Centers for Disease Control and Prevention (CDC). Vital signs: overdoses of prescription opioid analgesics—United States, 1999-2008. MMWR Morb Mortal Wkly Rep. 2011;60(43):1487- 1492. Centers for Disease Control and Prevention/National Center for Health Statistics, National Vital Statistics System, Mortality File. Retrieved from: http://www.cdc.gov/nchs/data/hestat/drug_poisoning/drug_poisoning.htm. Hedegaard H, Chen LH, Warner M.; National Center for Health Statistics (NCHS). Drug-poisoning deaths involving heroin: States, 2000–2013. NCHS data brief, no190. Retrieved from: http://www.cdc.gov/nchs/data/databriefs/db190.pdf . Food and Drug Administration. Risk Assessment and Risk Mitigation Reviews. Retrieved from: http://www.accessdata.fda.gov/drugsatfda_docs/nda/2014/205777Orig1s000RiskR.pdf. Creanga AA, Sabel JC, Ko JY, Wasserman CR, Shapiro-Medoza CK, Taylor P, Barfield W, et al. Maternal drug use and its effect on neonates:a population-based study in Washington State. Obstet Gynecol. 2012;199(5):924-933. Zibbell JE, Hart-Malloy R, Barry J, Fan L, Flanigan C. Risk factors for HCV infection among young adults in rural New York who inject prescription opioid analgesics. Am J Public Health. 2014 Nov;104(11):2226-32. doi: 10.2105/AJPH.2014.302142. Epub 2014 Sep 11. Mateu-Gelabert P1, Guarino H2, Jessell L2, Teper A2. Injection and sexual HIV/HCV risk behaviors associated with nonmedical use of prescription opioids among young adults in New York City. J Subst Abuse Treat. 2015 Jan;48(1):13-20. doi: 10.1016/j.jsat.2014.07.002. Epub 2014 Jul 11. Rolita L, Spegman A, Tang X, Cronstein BN. Greater number of narcotic analgesic prescriptions for osteoarthritis is associated with falls and fractures in elderly adults. J Am Geriatr Soc. 2013;61(3):335-340. Miller M, Sturmer T, Azrael D, Levin R, Solomon DH. Opioid analgesics and the risk of fractures in older adults with arthritis. J Am Geriatr Soc. 2011;59(3):430-438. Substance Abuse and Mental Health Services Administration. Center for Behavioral Health Statistics and Quality. Results from the 2013 National Survey on Drug Use and Health: Summary of National Findings. Detailed Tables, 7.2B. Retrieved from: http://www.samhsa.gov/data/system/files/NSDUH-DetTabs2013/NSDUH-DetTabs2013.htm#tab7.2b . Jones CM, Paulozzi LJ, Mack KA. Sources of prescription opioid pain relievers by frequency of past-year nonmedical use United States, 2008-2011. JAMA Intern Med. 2014 May;174(5):802-3. Curtis LH, Stoddard J, Radeva JI, Hutchison S, Dans PE, Wright A, et al. Geographic variation in the prescription of schedule II opioid analgesics among outpatients in the United States. Health Serv Res. 2006 2006;41:837-55. Reifler L, Droz D, Bailey J, Schnoll S, Fant R, Dart R, et al. Do prescription monitoring programs impact state trends in opioid abuse/misuse? Pain Medicine. 2012;13(3):355-6. Reisman RM, Shenoy PJ, Atherly AJ, Flowers CR. Prescription opioid usage and abuse relationships: an evaluation of state prescription drug monitoring program efficacy. Substance Abuse: Research and Treatment. 2009;3(SART-3-Shenoy-et-al):41. Worley, J. Prescription drug monitoring programs, a response to doctor shopping: purpose, effectiveness, and directions for future research. Issues in Mental Health Nursing, 2012, 33:319-328. Charles K, Cannon M, Hall R, Coustasse A. Can Utilizing a Computerized Provider Order Entry (CPOE) System Prevent Hospital Medical Errors and Adverse Drug Events? Perspect Health Inf Manag. 2014 Oct 1;11:1b. eCollection 2014. Wolfstadt JI, Gurwitz JH, Field TS, Lee M, Kalkar S, Wu W, Rochon PA The effect of computerized physician order entry with clinical decision support on the rates of adverse drug events: a systematic review.J Gen Intern Med. 2008 Apr;23(4):451-8. doi: 10.1007/s11606-008-0504-5. Mishuris RG, Linder JA, Bates DW, Bitton A Using electronic health record clinical decision support is associated with improved quality of care. Am J Manag Care. 2014 Oct 1;20(10):e445-52. Franklin GM, Mai J, Turner J, Sullivan M, Wickizer T, Fulton-Kehoe D. Bending the prescription opioid dosing and mortality curves: impactof the Washington State opioid dosing guideline. Am J Ind Med. 2012;55(4):325-31. Boyer EW. Management of opioid analgesic overdose. N Engl J Med. 2012;367(2):145-155. Walley AY, Xuan Z, Hackman HH, Quinn E, Doe-Simkins M, Sorensen-Alawad A, Ruiz S, Ozonoff A. Opioid overdose rates and implementation of overdose education and nasal naloxone distribution in Massachusetts: interrupted time series analysis. BMJ. 2013 Jan 30;346:f174. doi: 10.1136/bmj.f174. Haegerich TM, Paulozzi LJ, Manns BJ, Jones CM. What we know, and don't know, about the impact of state policy and systems-level interventions on prescription drug overdose. Drug Alcohol Depend. 2014 Dec 1;145:34-47. Clark AK, Wilder CM, Winstanley EL. A systematic review of community opioid overdose prevention and naloxone distribution programs. J Addict Med. 2014 May-Jun;8(3):153-63. Potter, J.S. ; Marino, E.N. ; Hillhouse, M.P., et al. Buprenorphine/naloxone and methadone maintenance treatment outcomes for opioid analgesic, heroin, and combined users: findings from Starting Treatment with Agonist Replacement Therapies (START). Journal of Studies on Alcohol and Drugs 74(4):605-613, 2013. Volkow ND1, Frieden TR, Hyde PS, Cha SS. Medication-assisted therapies--tackling the opioid-overdose epidemic. N Engl J Med. 2014 May 29;370(22):2063-6. doi: 10.1056/NEJMp1402780. Epub 2014 Apr 23.